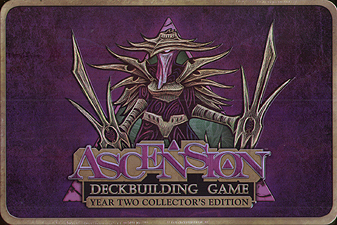 Enjoy the fan-favourite sets released in Ascension's second year with the Year Two Collector's Edition! Take on the rebel demigod Kythis and the restless spirits that have been unleashed in the wake of his bid for power. Battle in style - all 358 cards feature updated card frames in a premium foil finish! Beautiful cards and premium components make this the perfect centrepiece for your Ascension collection. Includes Ascension: Storm of Souls, Ascension: Immortal Heroes, and the entire second year of promo cards! Premium components include 100% foil cards, deluxe gameboard, portable storage box, dividers & token bag!